Monday: AM fog for some, mostly cloudy. Highs near 70. Monday Night: Some fog, showers west. 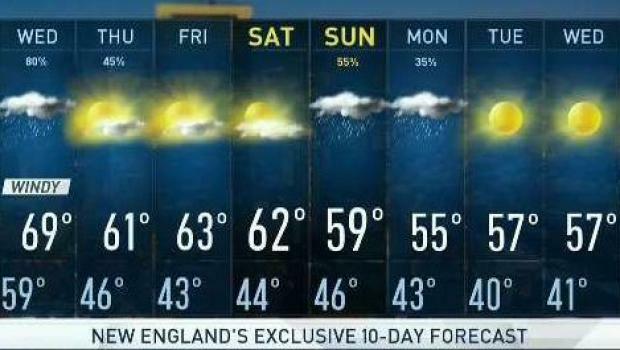 Lows in the 60s. Tuesday: Humid, breezy with showers. Highs around 70. 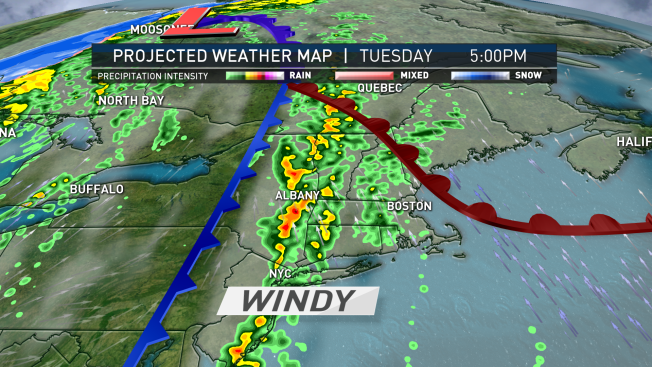 Our long dry spell in New England will come to an end this week as a storm delivers wind and rain for midweek. For now, the work week started with areas of dense fog and even a few pockets of drizzle that will lift for mostly cloudy skies with a few breaks of sun – with more sunshine breaking through in Northern New England. Surprisingly for October, even with lots of clouds and a southeast wind, we’ll find high temperatures near 70 degrees Monday afternoon with clouds producing little more than an isolated sprinkle toward evening. Nonetheless, an approaching storm center and attendant cold front from the Great Lakes will team up with departing high pressure – fair weather – to our east to create a difference in barometric pressure across New England. Big differences in barometric pressure often mean big wind – and our Early Warning Weather team expects the wind to increase from the south-southeast Tuesday into Tuesday evening, amidst passing showers, with gusts to 40 mph during the late afternoon. Overnight Tuesday night into Wednesday morning, heavier downpours with embedded thunder and south wind gusts to 45 mph will sweep from west to east across New England, resulting in widely scattered power outages, downed tree limbs and branches, and ripping plenty of leaves to the ground. All this means, Monday is likely the relative peak of foliage for New England. The weather will dry out from late Wednesday through the end of the week, with the chance of showers increasing again by Sunday and a decidedly fall feeling prevailing through most of the 10-day.